Add enterprise-grade calling features, improve reliability, and enable mobile users-while cutting your phone bills by over 50%. 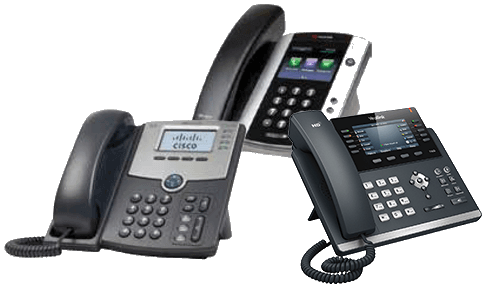 Desktop VoIP phones to span the spectrum of all employee needs. None of them require technical installation—just connect them to the Internet and they’re ready to go. 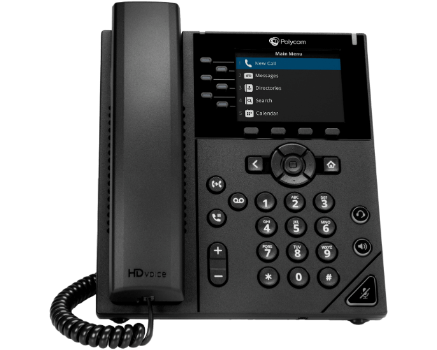 The Polycom® VVX® 201 is a simple, yet reliable, two-line IP phone, with two 10/100 Ethernet ports, that delivers enterprise grade sound quality. 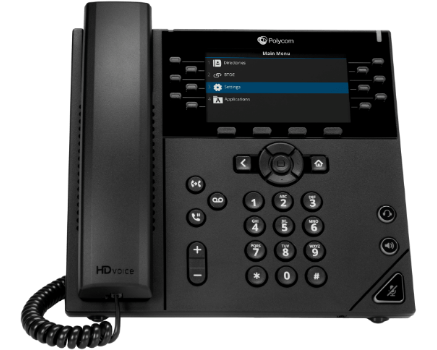 The Polycom VVX 201 phone is a stylish, cost effective telephony solution, ideal for retail environments, call centers or shared/common areas, such as lobbies, hallways and break rooms or anywhere needing simple and reliable connectivity. 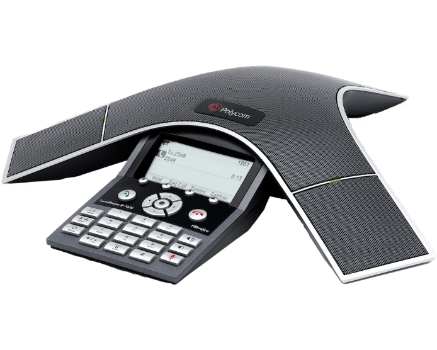 The Polycom® VVX® 250 business IP desk phone is a high quality, IP phone that delivers reliable performance and an enterprise grade sound quality. It is ideal for knowledge workers and cubicle workers who need the high-quality features that today’s modern business environment demands. 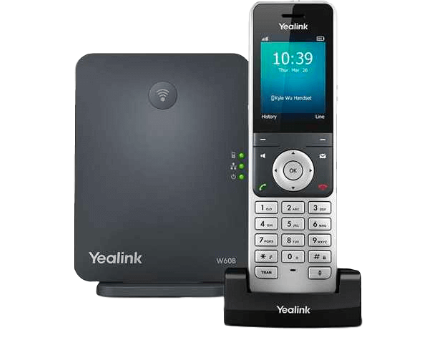 The Yealink® DECT IP phone W60P cordless phone system is the ideal solution for small and medium-sized businesses. It empowers users with the convenience of wireless communication along with the feature richness of VoIP telephony. Pairing with up to a total of 8 Yealink W52H/W56H DECT handsets, it allows you enjoy superb mobility and flexibility. 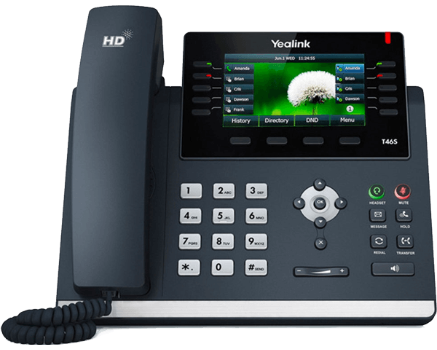 The Yealink® SIP-T42S IP Phone is a dynamic business communications tool for superior voice communications and extended functionality. 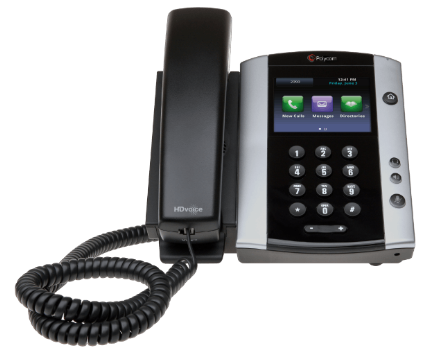 The SIP-T42S includes Gigabit Ethernet technology for rapid call handling. Plus, with an all-new USB port, the SIP-T42S boasts unparalleled functionality and expansibility with Bluetooth, Wi-Fi and USB recording features. 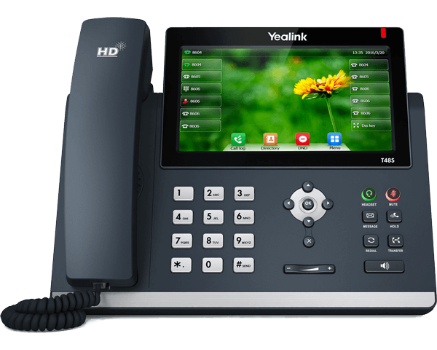 The Yealink® SIP-T46S Business IP Phone is the ultimate communications tool for busy executives and professionals with a rich, high-resolution TFT color display. 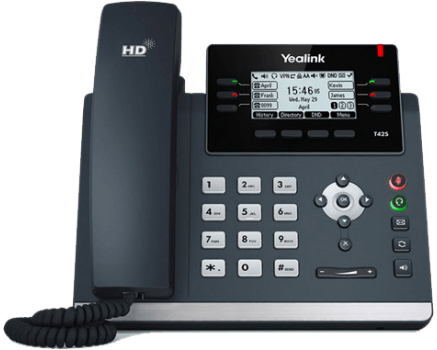 Built with Yealink HD technology, this device enables crystal clear communications. The SIP-T46S is also built with Gigabit Ethernet technology, for rapid call handling and use with accessories like a Bluetooth USB Dongle and a Wi-Fi USB Dongle. 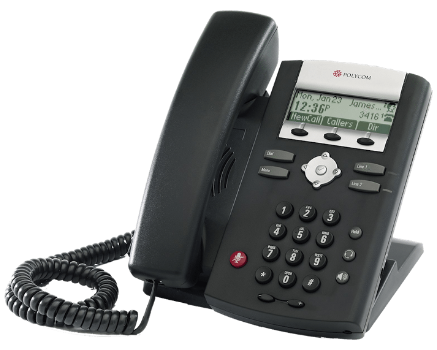 The Polycom® VVX® 450 business IP desk phone is a high quality, color performance IP phone for small to medium size businesses. It is ideal for knowledge workers, executives and upper management. The Polycom® VVX® 501 performance business media phone unifies superior voice capabilities and applications into a simple-to-use, yet high-performance unified communications (UC) solution. It is the ideal, all-in-one knowledge worker productivity tool, built to integrate seamlessly into a wide range of UC environments. The Yealink® SIP-T48S Business IP Phone is a dynamic business communications solution for executives and professionals. This phone offers a large touch screen that makes switching between pages and applications swift, easy and convenient. The SIP-T48S includes Yealink’s HD Voice technology for unparalleled audio clarity. The phone uses Gigabit Ethernet technology for rapid call handling. 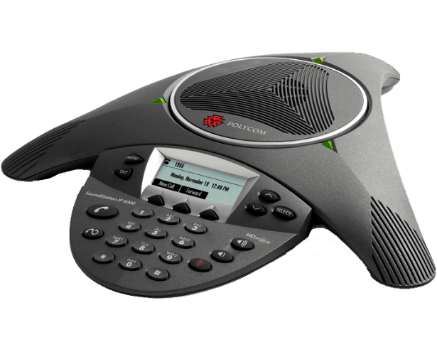 The Polycom® SoundStation® IP 5000 conference phone delivers remarkably clear conference calls for small conference rooms and executive offices. 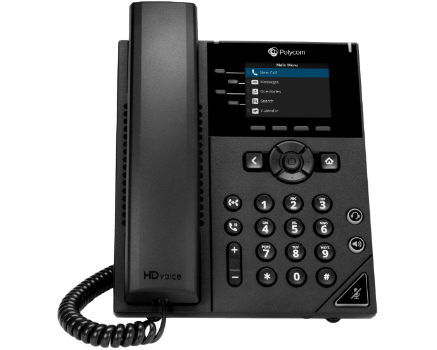 It features Polycom HD Voice™ technology, broad SIP interoperability, and a modern design that is ideal for smaller rooms—all at an affordable price. The Polycom® SoundStation® IP 6000 is an advanced IP conference phone that delivers superior performance for small to midsize conference rooms. With advanced features, broad SIP interoperability and remarkable voice quality, the SoundStation IP 6000 offers a price/performance breakthrough for SIP-enabled IP environments. 12-foot microphone pickup — combined with Automatic Gain Control for performance far beyond older SoundStation IP conference phones. Add up to two optional expansion microphones for even greater coverage. 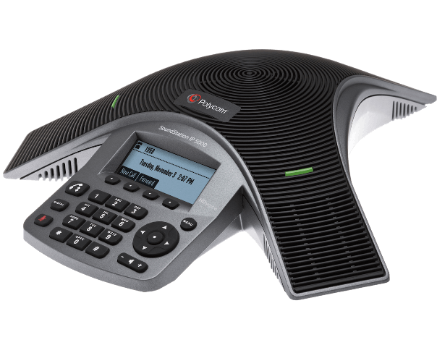 The Polycom® SoundStation® IP 7000 is a breakthrough conference phone that delivers outstanding performance and a robust feature set for SIP-based VoIP platforms. It is the most advanced conference phone ever developed, and is ideal for executive offices, conference rooms, and boardrooms.